When designing a living space that balances beauty, function, and comfort, it is worth taking into consideration what type of lines are prominent in each room. Interior design divides lines into four categories: vertical, horizontal, angular and curvilinear. Each line type plays a part in setting the tone of your living space. Vertical lines add height while horizontal lines give the appearance of length. Angular lines, also known as diagonal or zigzag lines, give a sense of visual excitement while curved lines add softness and comfort. While vertical, horizontal and angular lines are significant elements in any interior design, the incorporation of curved lines is what gives your home that cozy feeling. Striking the right balance of straight and curved lines will guarantee a sense of welcome and relaxation in your living space. Curved lines can be broken down into three categories: circular, freeform and tight. You can easily integrate one or more of these types of curves into your home’s look through furniture choices, architecture or even accessories. Be sure not to overwhelm the space with too many curved elements or the look can become too overpowering. Many flooring options contain curvilinear lines. Tile usually provides angular lines, however, in styles such as wood-look tile, the curvilinear wood grain pattern provides remarkable contrast. Stone includes patterns which counteract the angularity of the tile shape. 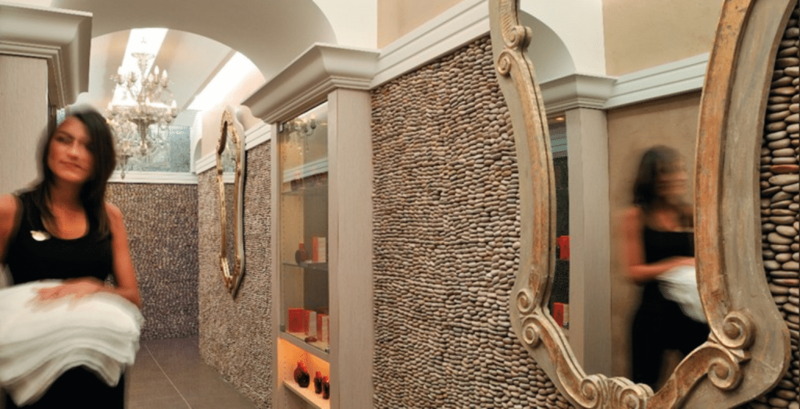 Pebble mosaics contain curved lines within the pebbles along with the patterns created by the overall mosaic layout. Some pebble mosaics also produce curvilinear texture by featuring full stones rather than a flat surface. Circular lines from everyday objects can help add excitement to a plain looking room. Choosing a round table for an angular kitchen can add a focal point. In the living room, large couch shaped in a semi-circle with a round coffee table will also provide a stunning effect. Architectural elements such as an archway between rooms or a domed ceiling also provide visual weight. Freeform lines are more irregular in shape and can range from spiral patterns to a wavy, meandering movement reminiscent of nature’s unexpected and mysterious designs. Good examples of freeform lines in interior design are spiral and curved staircases as well as indoor plant life or an asymmetrically curved area rug. Tightly curved lines are showcased well through intricate elements of design. Such as a complicated iron staircase pattern, an embellished tapestry, or area rug. Floral shapes enhanced with the help of bright colors also help add some tight curves to a room. Be sure to maintain balance in any space. Too many curves can overpower a room, so be sure to keep straight lines in place to provide balance.